It's got an extremely sharp convex blade with a small top swage that scarcely dips to the tip, constructed from VG10 steel. VG10 (aka V Gold 10) is a high quality steel commonly found in elite Japanese chef knives. 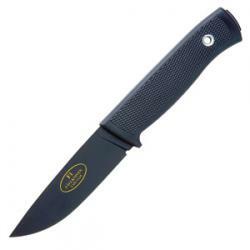 It's also an ideal size for a small utility knife, at 8.38 inches overall with a 3.82 inch blade.